Asked if I knew where the familiar lines "They shall grow not old, as we that are left grow old" originated, prompted me to add this post. the words are from the fourth stanza of a poem by Laurence Binyon, and the full poem is printed below. The plaque pictured above was unveiled in 2003 at Polzeath, Cornwall to commemorate the place where the poem, For the Fallen is believed to have been composed. 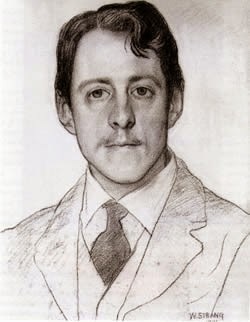 Laurence Binyon is said to have composed his best known poem while sitting on the cliff-top looking out to sea from the dramatic scenery of the north Cornish coastline. 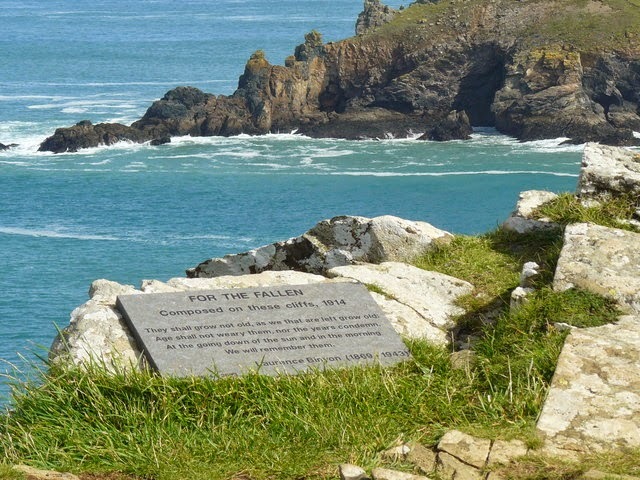 The plaque is located at Pentire Point, north of Polzeath. There is also another small plaque on the East Cliff north of Portreath, further south on the same north Cornwall coast, which also claims to be the place where the poem was written. The poem was written in mid September 1914, a few weeks after the outbreak of the First World War. At this time the British Expeditionary Force had suffered casualties following its first encounter with the Imperial German Army at the Battle of Mons on 23rd August and action during the retreat from Mons in late August. The force also suffered casualties at the Battle of Le Cateau on 26th August. and during its participation with the French Army in holding up the Imperial German Army at the First Battle of the Marne between 5th and 9th September 1914. Laurence is quoted as saying that the four lines of the fourth stanza came to him first, in 1939. These words of the fourth stanza became famous, after being adopted by the Royal British Legion as an Exhortation for ceremonies of Remembrance to commemorate fallen Servicemen and women.